"Well as you all know Mary was a sinless woman who never did anything wrong in her entire life. That's why she's called the Immaculate Conception. She lived a clean life that was pleasing to God and she accepted his will when she brought Jesus into the world. And what is more amazing is that she went to heaven both body and soul. 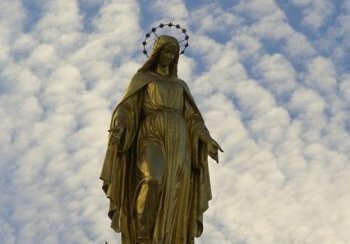 Throughout the years she has appeared to various people in many parts of the world and has given them warnings about what will soon come to pass. A lot of these people have started to pay devotion to her and many wondrous miracles can be attributed to her divine intercessions. That's why we say fifty-three Hail Marys when we pray the Rosary in addition to the Hail Holy Queen." "Of course it is. If you read the Bible, Romans 13:1 says: “Let every soul be subject unto the higher powers. For there is no power but of God: the powers that be are ordained of God.” So you see, everything I do is divinely inspired because God has given me the power to make such a ruling." The Holy Father went on to conclude though that he is still uncertain about whether Catholics should say: "In the name of the Father and of the Son and of the Holy Spirit and the Holy Mother or In the name of the Father and of the Son and of the Holy Spirit and of Mother Mary " when they make the sign of the cross before they pray. Regarding that issue he will make an official decision in a few weeks' time. In the interim though, he said that either name can be applicable to the fourth person of the Holy Quartet. As he referred to the new Godhead.